“I might also look out of the window occasionally,” adds the skipper, deadpan. Large, good humoured and loquacious, Murphy is an easy man to like. He has left his wife, Karen, at home tonight. But with nine-month-old twins to contend with there, he might actually have got the cushier end of the deal. Aurora Borealis is not designed to accommodate spectators. It has two bunks, two cups, two chairs and two spoons. During the Celtic Tiger years, when Irish labour was in short supply, Murphy spent four lonely years working with a Romanian crewman who didn’t speak a word of English. When that man returned home two years ago, a friend recommended McCarthy, a local. McCarthy comes from fishing stock. His late cousin Ger Bohan skippered Honeydew II, which was lost off the coast of Waterford in 2007. Murphy doesn’t come from a fishing family. His father was an insurance broker. It was a summer job on a fishing trawler that inspired in him an enduring love for this hard-scrabble life. Today about 14 fishing trawlers operate out of Kinsale. That figure has held steady, more or less, in recent years. But Kinsale is the exception. Up the coast, Dingle has about 20 boats, down from 60 or 70 a decade ago. 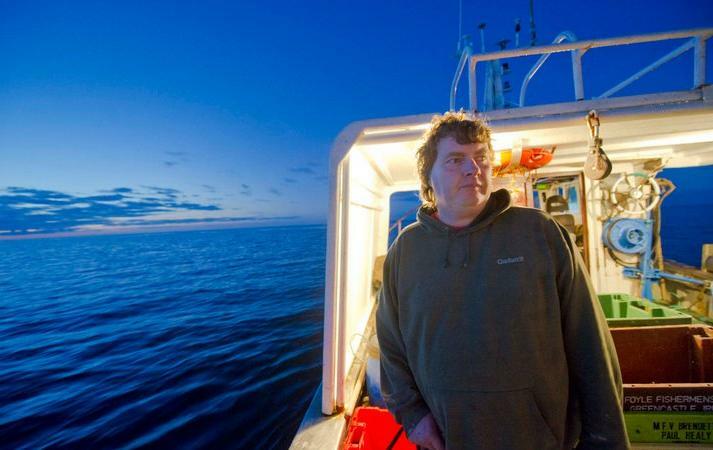 If commercial fishing is a calling, the industry is experiencing a serious fall-off in vocations. Rising fuel prices are at least partly to blame. To recoup their costs, large trawlers must now remain at sea for seven or eight days at a time, placing strain on crews’ family lives. Smaller boats, such as Aurora Borealis, meanwhile, have had to diversify into lobster potting, which is more fuel-efficient than trawling but also much more labour-intensive. Lobster pots are expensive to buy and maintain, leaving Murphy (who also had to replace his ship’s propeller this year) with just enough income for his young family to get by on. “As I said,” he repeats, “you have to love the work.” And it’s obvious he does. As the lights of Kinsale Harbour fade into the distance he grabs a tin whistle from the shelf and plays a familiar tune. AT 4.40AM, MURPHY announces that it is time to clutch in the hydraulics. I have no idea what that means, but I follow the pair out on to the deck. Murphy unwinds the trawl net using a mechanised hauling system while McCarthy guides it into the ocean. About 150m of steel cable follows the net down into the grimy surf. Stocks of white fish are low in these waters, Murphy explains. But this has meant a corresponding rise in the number of prawns. A box of them sells for about €100 back at the harbour, so a couple of boxes would cover our diesel costs for the day, with a little change to spare. But prawns are most numerous at dawn, hence our extremely early start. His work done for now, McCarthy goes below deck to bunk down for a couple of hours. Murphy and I repair to the wheelhouse for another round of tea. At 5am, news bulletins report that the world’s economy has just tanked, or cratered, or whatever it tends to do these days. But the skipper is not unduly concerned. He seems much more interested in practising his tin whistle. Just above the horizon, to the east, the first flicker of dawn is breaking. I suddenly feel very tired. Murphy offers me his bunk downstairs. I don’t need to be asked twice. The sleeping quarters are cramped and claustrophobic, but I drift off soon enough. When I awaken, sunlight is streaming in, and, even above the din of the ship’s engine, I can detect the sound of Murphy’s tin whistle. “Good morning! Good morning!” the sergeant did cry. IT’S 8AM NOW. The skipper and Michael Mac Sweeney, the photographer accompanying us, are resting below deck while McCarthy and I man the bridge. He’s not a talkative man, Mike McCarthy. In fact you’d get more chit-chat from a Mafia hood in an interrogation room. After a couple of failed opening gambits, I give up and find something to read. He watches television. So engrossed is he in Ireland AM, and I in a copy of the Tide Tables 2011, that we scarcely notice a rigid inflatable boat from LE Emer speeding in our direction. It pulls alongside and two naval officers clamber aboard. Ensign Dubheasa Ní Cionnach and Petty Officer Jason Whelehan are conducting a routine inspection. They examine the ships’ logbook, its licence and its registration. They check the crates on deck to make sure we’re not carrying excess fish. The skipper rises from his bunk to greet them, then sees them off in good humour. What can I say? I’m a medical wonder. Murphy wipes his penknife on his sleeve and offers me a slice of apple. I politely decline. “You didn’t get much out of Mike, I’d say.” I shake my head, still feeling nauseated. A seagull dropping splats on the deck and I’m up again. Murphy has a point, though. As I lean over the side of the boat I can actually see my own reflection in the water. At 10am, the crew don oilskins and begin hauling in the nets. With considerable effort, the catch is dragged on board. We may have been trawling for prawns, but these nets don’t discriminate. McCarthy pulls at a piece of cord and, suddenly, every sea creature imaginable is flapping and wriggling about on the deck: prawns, monkfish, brill, megrim, dogfish, starfish and something that looks like (but presumably isn’t) a hedgehog. It’s an awesome sight. A ling slithers at my feet, its mouth petrified in an expression of existential anguish. McCarthy shovels about two-thirds of the catch, both dead and alive, back into the sea, sparking a frenzy among the gulls that have been trailing us for miles. Like James Coburn’s character in The Magnificent Seven, he doesn’t say much. But he’s useful with a blade, gutting and sorting hundreds of fish in a matter of minutes. IN THE WHEELHOUSE, Murphy is peeling potatoes. As well as its two bunks, two cups, two chairs and two spoons, the trawler has two plates, two knives, two forks and one pot. Today’s dinner is pork and potatoes. Once that’s cooking, he comes outside to inspect the morning’s catch. It’s a disappointing haul. All counted, there is less than a box of prawns and maybe a box and a half of other, miscellaneous catch. Scarcely enough, in other words, to cover the cost of the day’s diesel. But we press on. From here on, it’s all profit. McCarthy returns to his bunk while Murphy sits down and serenades the gulls. He took up the tin whistle only recently, he explains, but he is determined to perform at a session at the Spaniard pub the following evening. There have been times, Murphy admits, when he has regretted not choosing a more secure living. He is 42 now. He will be almost 60 when his children reach third level. Will he still be able for this work at that age? He doubts it. After lunch, Murphy and McCarthy drag in another catch. There is lots of seaweed this time, and an empty can of beer, but also plenty of cod. Piled high in a crate, they look like enormous elephant ears with mouths. As Murphy and McCarthy get to work sorting through the haul, I begin to wonder if I’m getting in their way. Murphy is quick to reassure me. “Sure, you’ve been in my way all day,” he says with a laugh. It sounds like the life of a freelance journalist, I tell him, just with higher overheads. I put down my notepad and pen, and he picks up the tin whistle. On the horizon, Kinsale Harbour and The Spaniard pub are looming.